You are currently browsing the tag archive for the ‘Monasterboice’ tag. 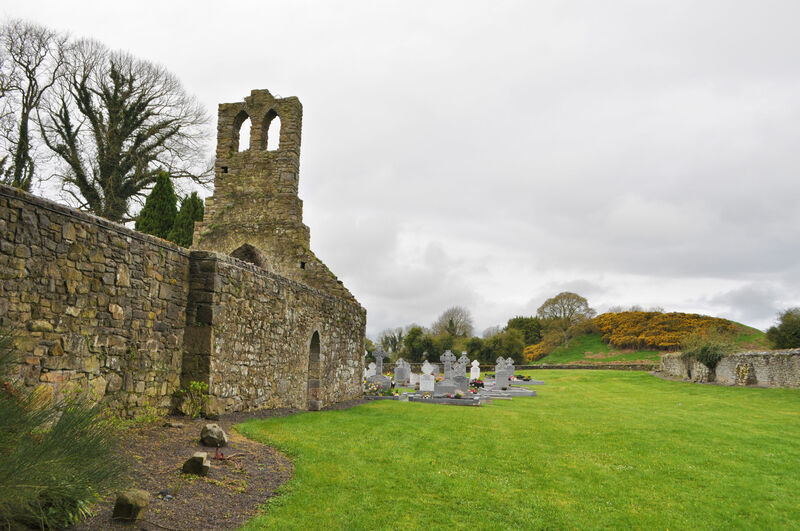 Michael Fox picked us up in Dublin and took us on a Boyne Valley tour. 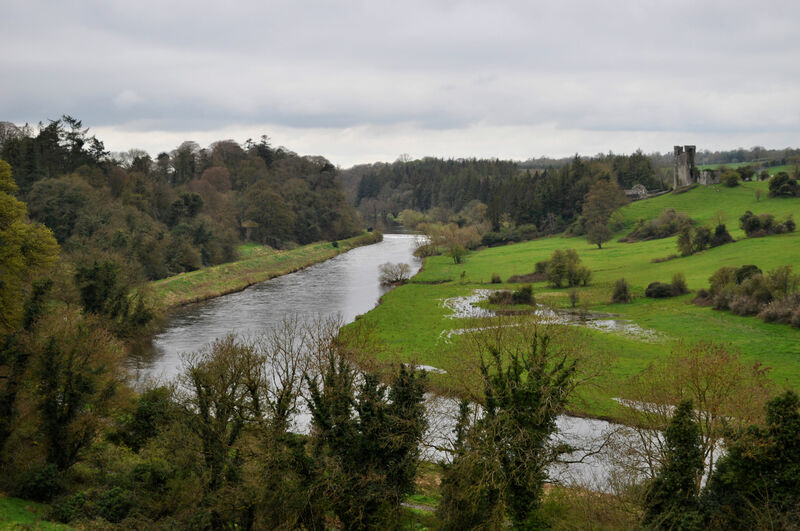 Most of our trip is on a budget, but we splurged for one thing: an all-day tour of the Boyne Valley. This particular region is packed with neolothic sites and points of interest, and we had little confidence in our own ability to get around to see much of it in one day. We solved this problem by hiring Michael to take us around. He studied the region as a hobby, and one day nine years ago decided to turn his fascination into a job. 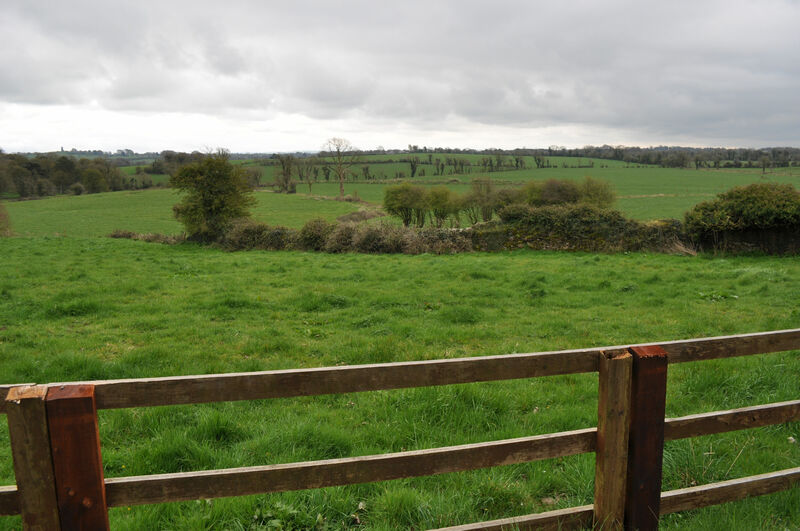 Now he works as a tour guide, taking people on full-day personal tours of the Boyne Valley, north of Dublin and west of Drogheda. Our first stop in the morning was Newgrange. 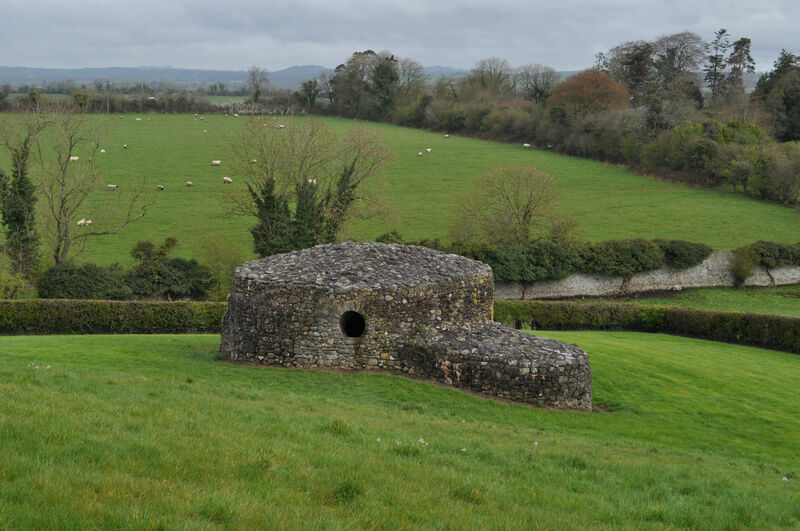 On his website, Michael describes it like this: “Newgrange is a Stone Age monument in the Boyne Valley, County Meath, Ireland. It was built about 3200 BC during the Neolithic period, which makes it older than Stonehenge and the Egyptian pyramids. 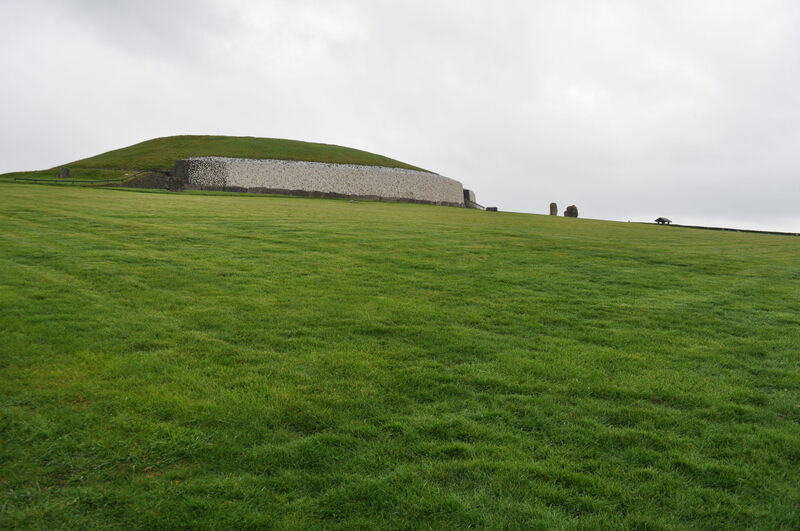 Newgrange is a large circular mound with a stone passageway and chambers inside. The mound is ringed by ‘kerbstones’ engraved with artwork. 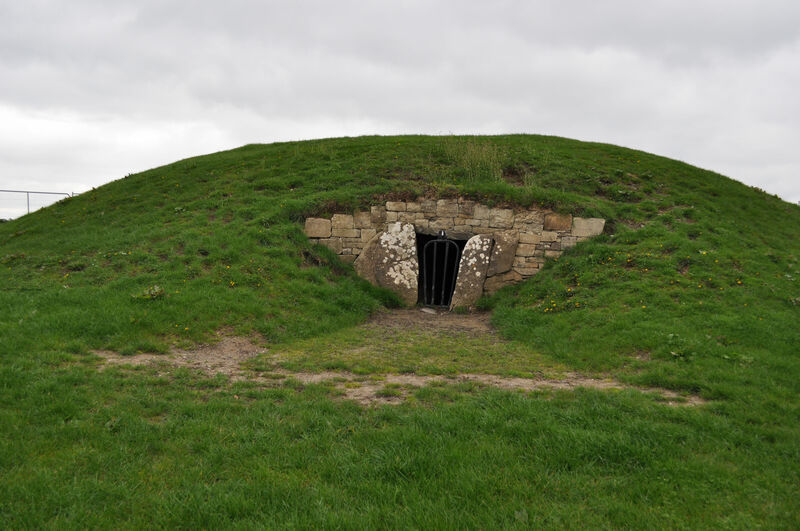 It is the best know monument within the Brú na Bóinne complex, alongside the similar passage tomb mounds of Knowth and Dowth.” Note that he calls it a monument, while it’s scientifically referred to as a passage tomb. The “passage” part of that name is due to the long narrow passage leading to an inner room. However, most current scientists will agree these mounds are not tombs, or at the very least, much more than tombs. 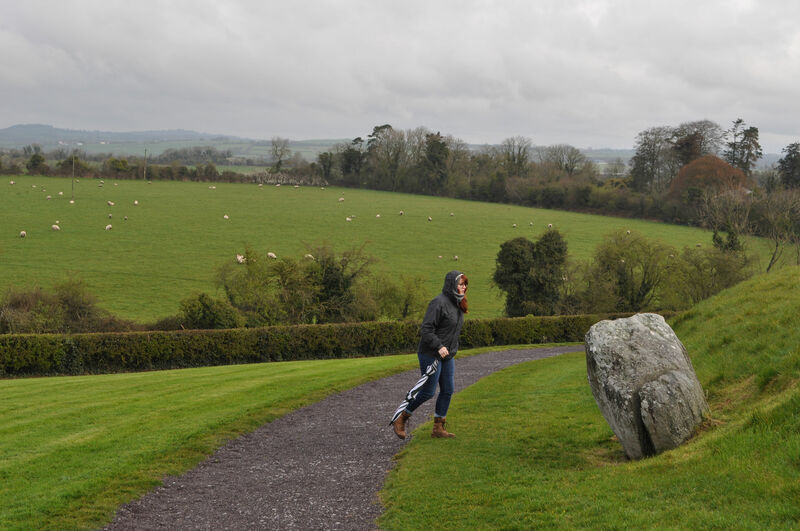 Our first look at Newgrange, as we walked up the hill toward it. 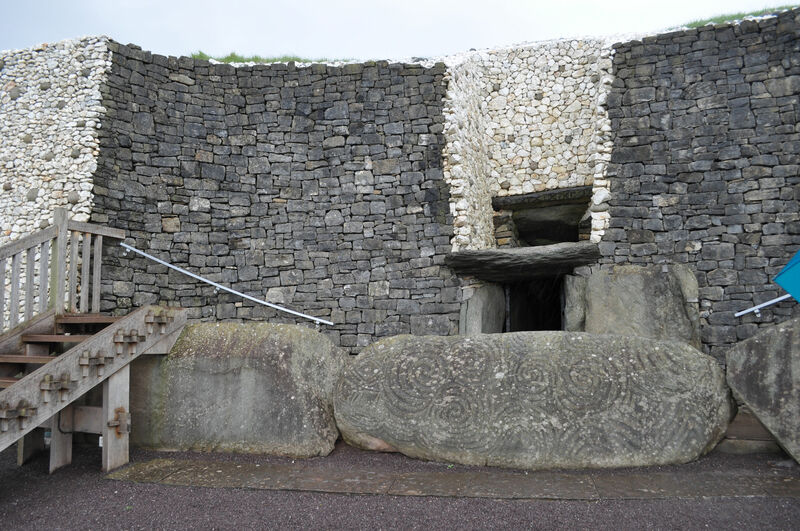 The entrance into Newgrange. Note the fabulously carved entrance stone. While we waited for our turn inside, we explored the outside. These enormous stones ringed the outside and some of them were carved. Each stone was carved differently and Tara and I imagined what the shapes could mean. We found this intriguing hut of stone. It turned out to be a novelty building that some farmer built out of scavenged stones from the site. It has little cultural significance. We were not allowed to access the site without supervision, and not allowed to enter without a guide. This was fine with us, because the guide told us more about the site and helped us appreciate it while we were there. We were not allowed to photograph the inside. We entered here, the entrance you see in the above photo, and walked through a very narrow passageway into a central room. The guide turned out all the lights so that it was pitch black, then lit another light to simulate sunlight streaming through into the room as it would during 17 days of solstice in December. This would have given hope to the people at that time that days were getting longer, and Spring was coming again. I am not that superstitious, and find myself a practical person in most situations. When I walked inside and felt those gigantic stones surrounding me (the inside is filled with stones the size of the ones out front), I felt a presence. I felt something, and I didn’t want to leave. I reached out to touch the stones; to put my hand onto the stones that a hand had touched 5,000 years ago. How incredible. 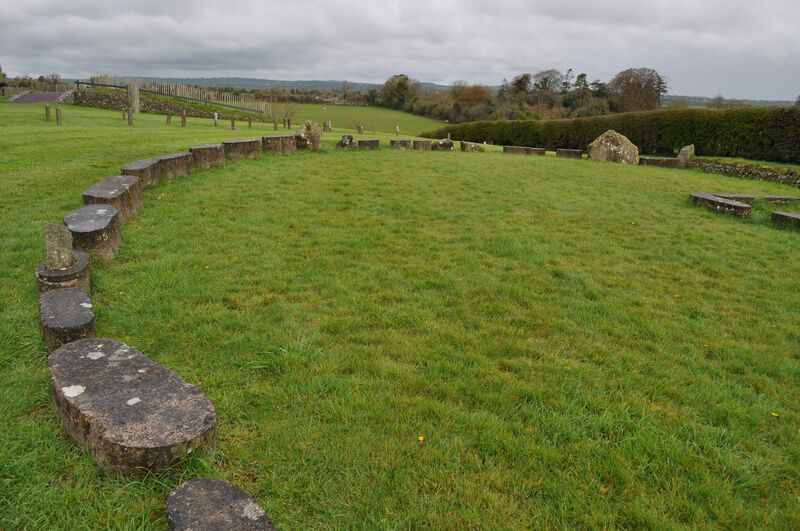 This is a ring of stones we found outside Newgrange after our tour. Next we went to nearby Dowth, part of the same historical complex. Dowth is unexcavated, and for that reason I found it particularly appealing. 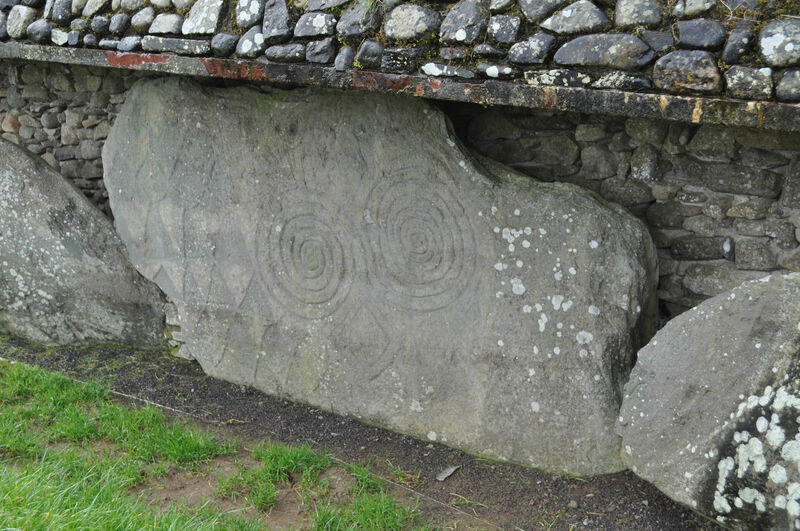 No modern human has attempted to put his own interpretation onto the outside of the site, as was done at Newgrange. 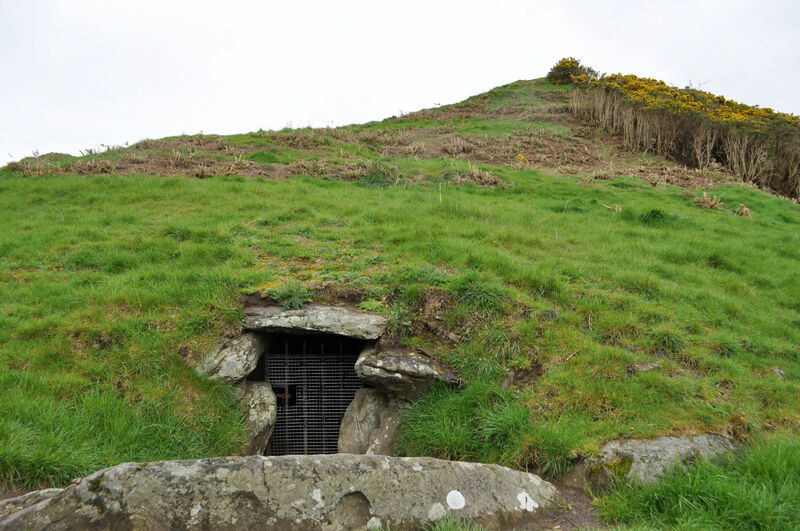 There is a hill over two entrances, and the tops of the outside circular stones showing. Hillside of Dowth, with high gorse. 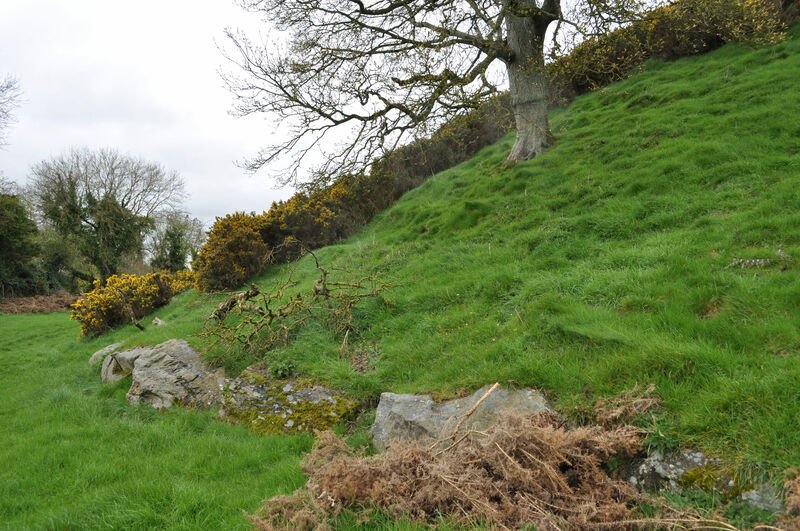 Some effort has been made to cut down the gorse, which is similar to the bush I would call Scotchbroom. You can see the tops of massive stones ringing the hill. One of the entrances at Dowth. Behind it, gorse is chopped down on half the hill. 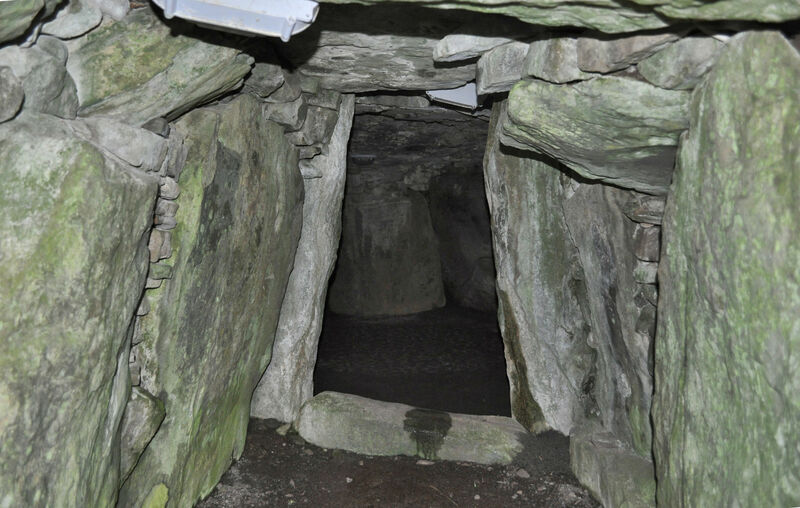 This is inside the entrance at Dowth, and gives some idea of what it was like inside of Newgrange. We also saw a cemetery from the top, and Tara wanted a close up look at it. …So we went to the cemetery. From there we looked back up at Dowth. 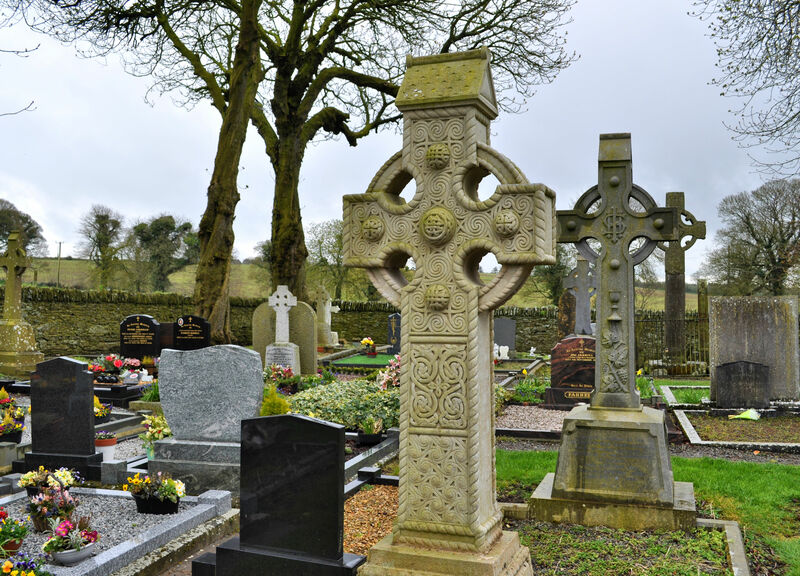 Michael took note of how much we enjoyed the cemetery, and next took us to see the High Crosses at Monasterboice. The site was a monastery that existed in the 6th century. The High Crosses are very large crosses that date to the 10th century with carved scenes from both the new and old testaments of the Bible, possibly used as a teaching tool to help a congregation. This is an example of the teaching scenes on the High Crosses. 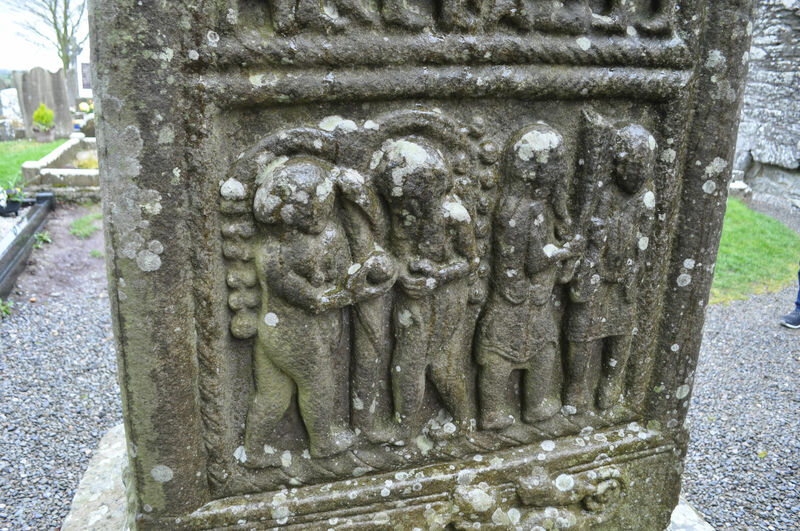 Here on the left, Adam and Eve hold an apple. On the right, Cain holds a weapon toward Abel. 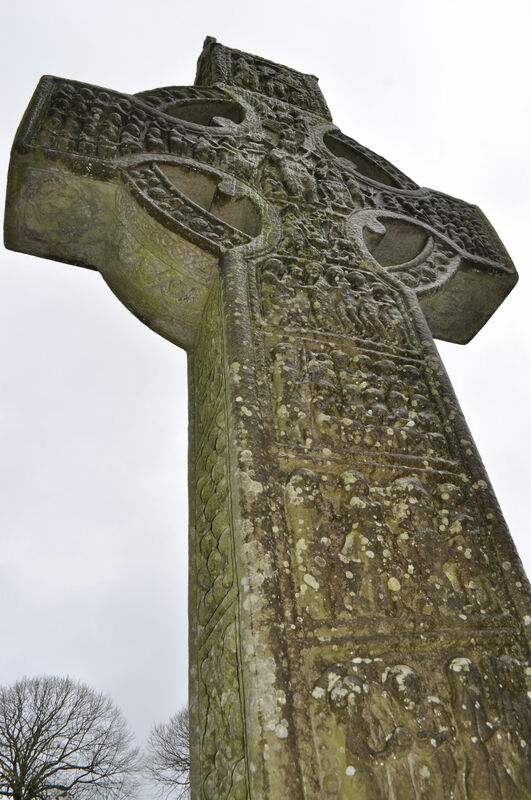 This is Muiredach’s Cross, the more significant High Cross. 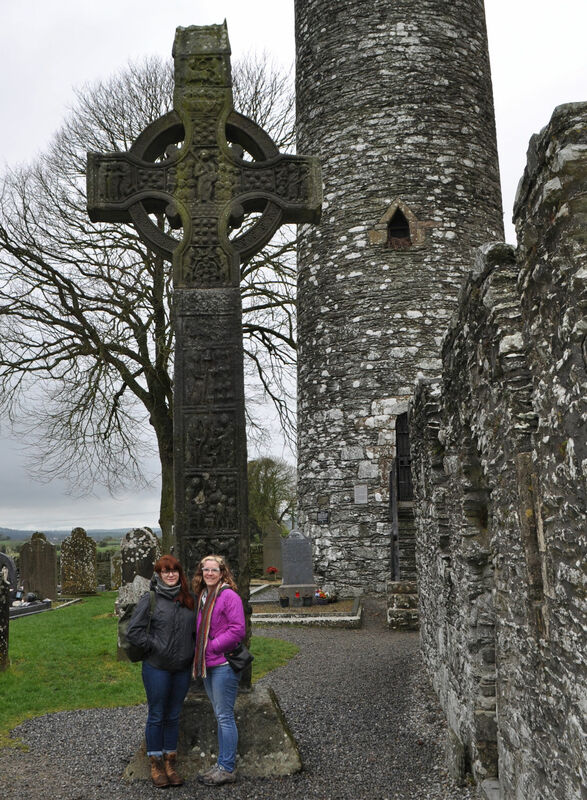 Tara and me in front of the other High Cross at this site. The remains of the monastery behind it. Much smaller crosses in the cemetery that surrounds the high crosses. This gravestone is interesting because it was carved onto a stone that was already sort of gravestone-shaped. It was midday and time for a bite to eat. 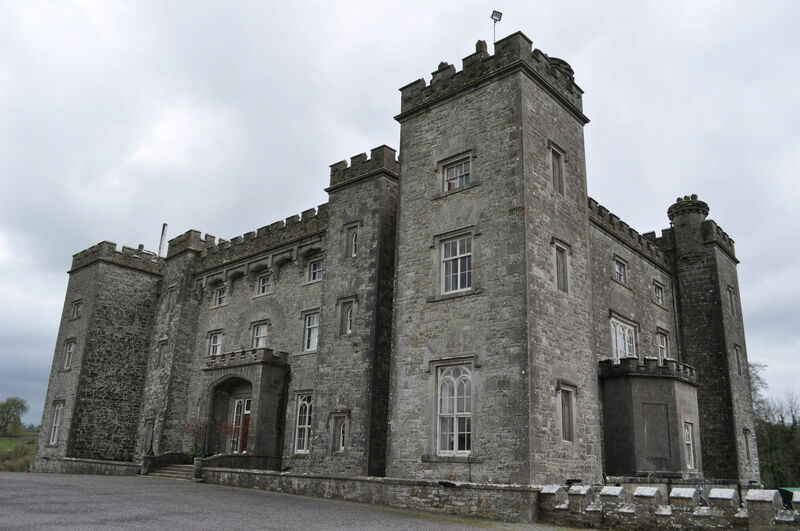 We went next to the Slane Castle, which is really a faux castle. Wealthy property owners had their home built to look like a castle. Today it is open for tours and weddings, and once a year hosts a gigantic concert. Michael said he saw U2 perform here in 1981 when they were the opening band for Thin Lizzy. In the lower level of Slane Castle is a lovely little cafe. Tara and I had ordered carrot soup and sausage rolls the day before and liked it so much we ordered the same thing again. It was scrumptious. 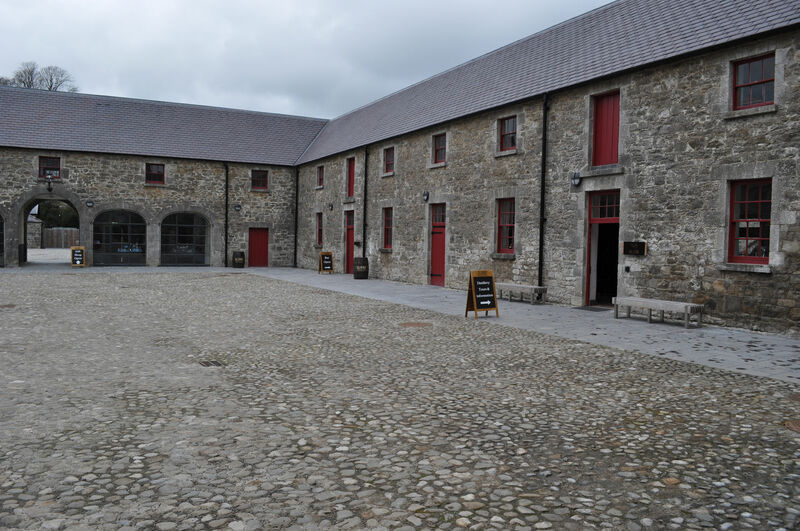 After we ate, we walked over and explored the Slane whiskey distillery. Entrance to the old stables, now hosting a whiskey distillery. 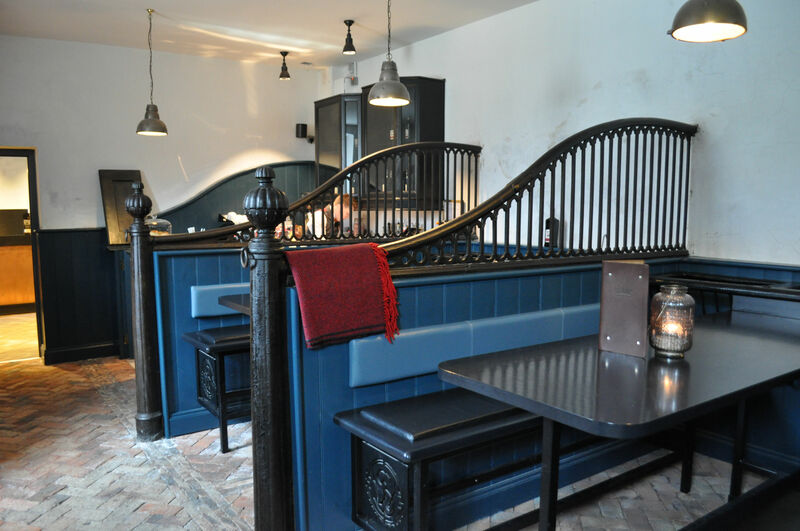 There is a bar at the distillery, where the individual stalls for horses have been somewhat maintained, and made into booths for customers. Tara and I sampled the whiskey of course. But I was already a fan of Slane before I went to Ireland. Back on the tour, we next stopped at another cemetery that had some ruins in it. 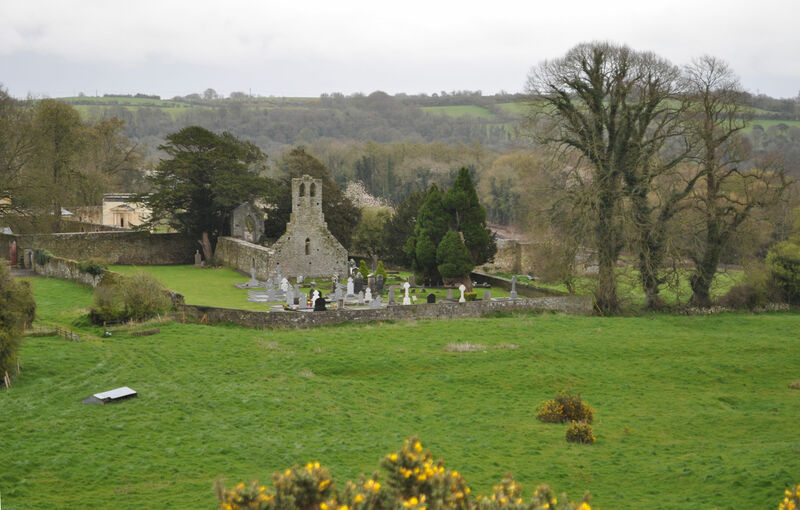 From the cemetery was a lovely view of the River Boyne and a castle-type ruin there too. 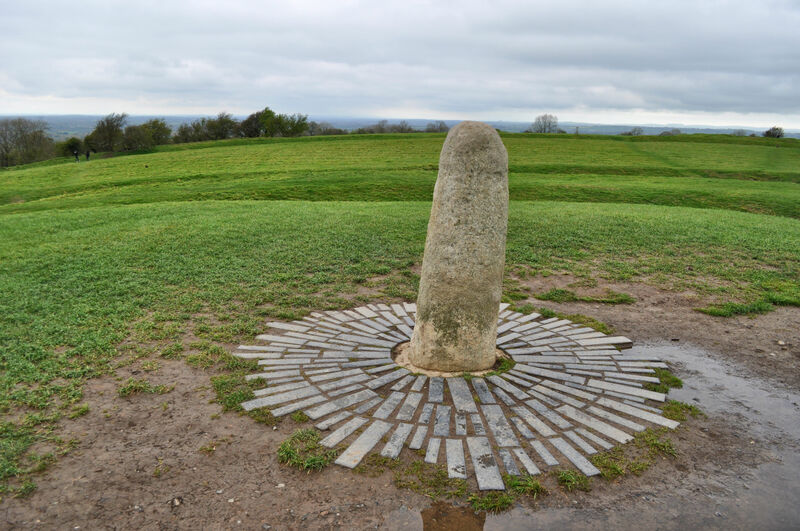 Next was a stop that we had been looking forward to: The Hill of Tara. This site has been important for thousands of years. 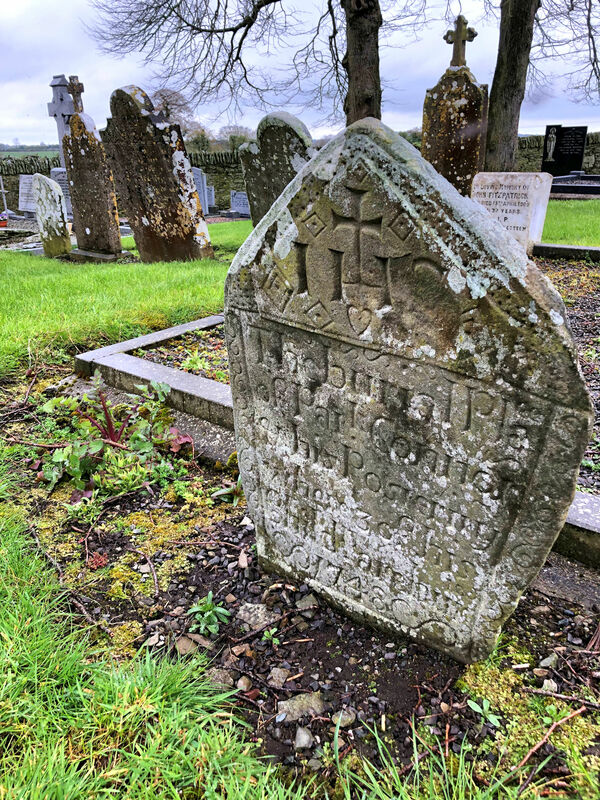 The site is much more than a hill, and more like a compound of many important places, including passage tombs, memorials, wells, an promendade and a church. 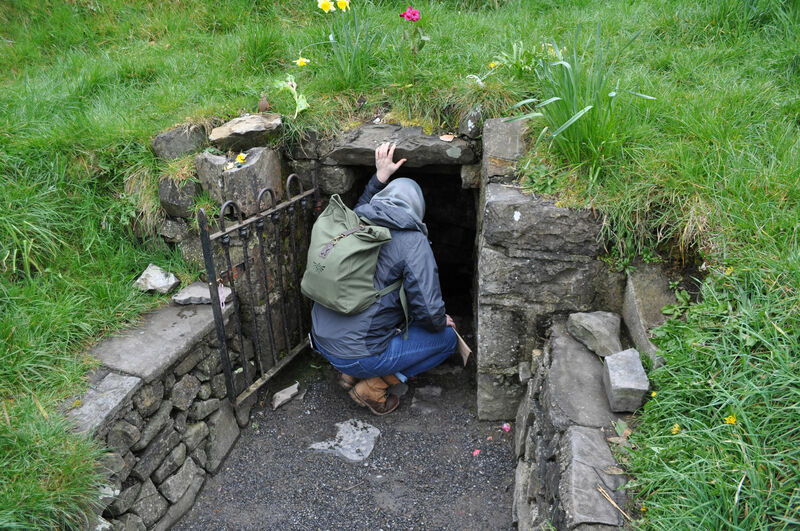 We stopped first at the passage tomb called The Mound of the Hostages. It is a Neolithic structure, built between 3350 and 2800 BC, and is believed to be the oldest part of this complex. We then walked up the hill to the Stone of Destiny. 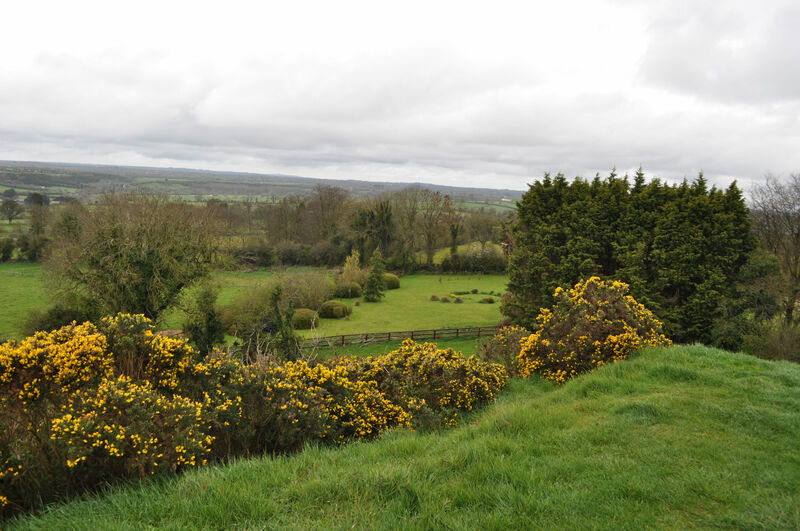 It was said to roar when touched by the rightful king of Tara. Of course we both put our hands on it. Just to check. 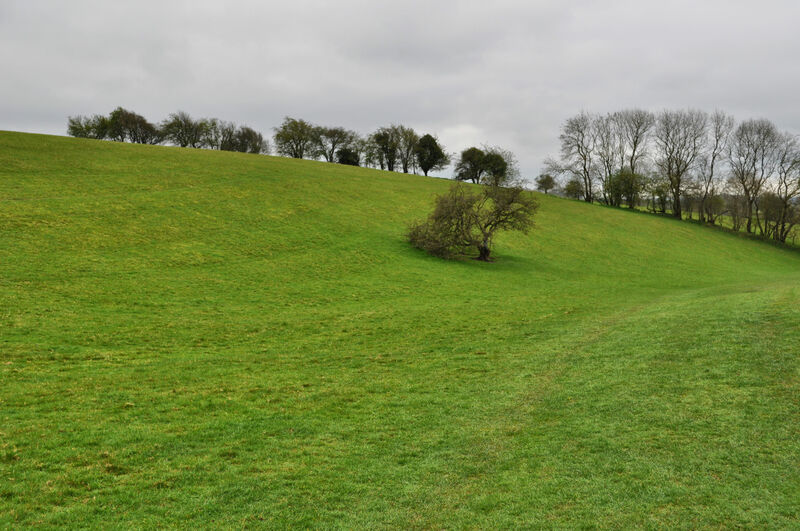 After that we walked across the large grassy area while Michael told us about how techonological advances such as LIDAR and ground penetrating radar are revealing new discoveries, and how this is improving theories people have about the site. 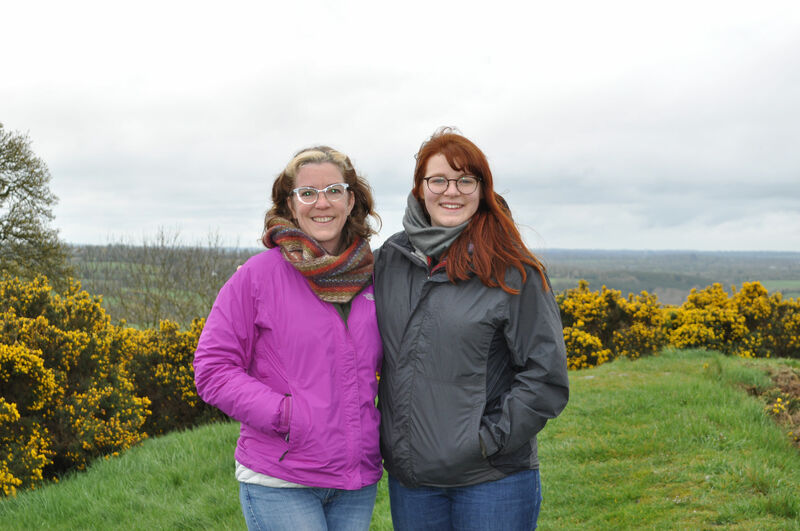 We found a fairy tree, we walked up a long promendade (curiously named “Banquet Hall”) from a lower area up to the top of the hill again, and then gazed in every direction, as the Hill of Tara offers a 360 degree view. 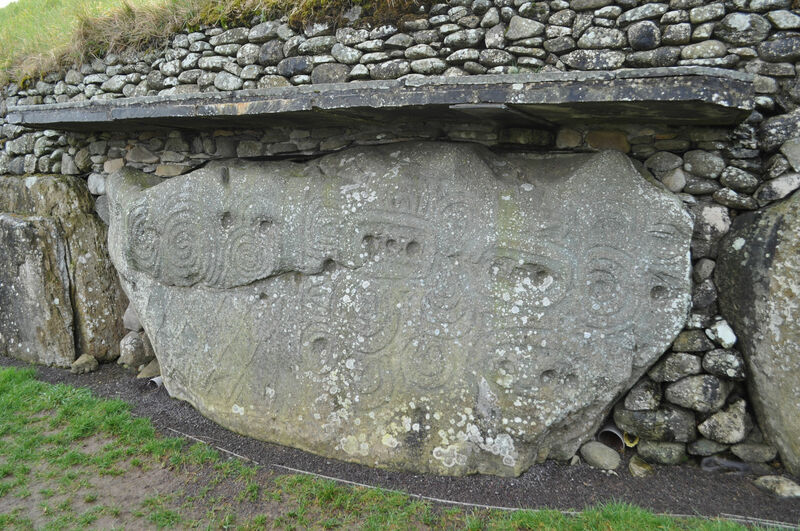 Mound of the Hostages is a dramatic name for this passage tomb. Stone of Destiny did not roar when either of us touched it. I guess we’re not Kings of Tara. Tara peeks into one of several wells at the site. This one is called Well of Tara. It had been a long day and it was time to head back to Dublin. Michael drove us all the way back and to our hotel near Heuston Train Station (we were headed out on the train the next day). We had fun chatting all day, got great tips for what to do in the remainder of our stay, and were truly grateful for our time with Michael. It was a great decision to hire him as our guide.